Find more events with PowerObjects! Sarah: We love giving back to the community. It’s part of our ethos at PowerObjects, and these events allow us to do that. Terah: It’s important for PowerObjects to participate in these types of events because it really does give us that personal interaction with people. Marco: This is a place where the Dynamics 365 community comes together across the whole region. There’s people from different countries coming here, discussing their challenges they have with Dynamics 365, but also, sharing some of the solutions that they found. And it’s a great learning experience for everyone, but at the same time, it’s a great community, great sharing. Neil: Getting out brand out there and meeting people is important, but also, the content and the network. If you’re gonna promote a product in the community, you’ve got to be part of it. And I think that’s really important. Terah: I think PowerObjects stands out at these types of events because we have so many people who add so much value in all the sessions that they’re doing, and people are constantly coming to our booth and talking about how much value they got from those sessions. Remedios: They even have told me sometimes when I was walking around, asking me small questions about Power BI. It’s great to be able to share all this knowledge with them, and always to learn something new. Sarah: People are just so happy to get involved and ask questions. We get questions after the sessions. We get questions just on concourse areas. It’s great to actually have a booth as PowerObjects, because it means that we actually have the space that people can come to and meet the rest of our team, because everyone has so much stuff to share, and that’s what Dynamics community is about, and that’s why PowerObjects just enjoys being a part of this whole thing. Tad: I found the audience very engaged. They asked really good, pointed, questions. It’s fun to see light bulbs come on from people getting a tip, something they’ve been struggling with, and they come away where they can immediately apply that in their home system. Marco: We share some of the great learnings that we have across our work-client base. 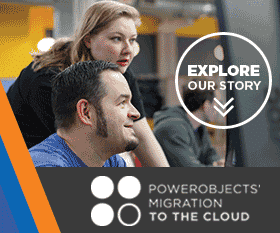 Being able to talk about the theory, all the learnings that we have at PowerObjects, but bring a real life example with our customers and get them to share the experience that is working with us, and also, delivering that technology through a real use case. Mario: The good thing about PowerObjects is that integrate really well with the teams that they have, and they said that they’ve really well with Investec. Going to events with PowerObjects, it kinda feels like you’re going with colleagues rather than being a customer of them. So it’s fantastic to come, to be a part of the experience with PowerObjects. Marco: It’s been an awesome experience to connect with old friends, new friends. Sarah: It’s been amazing. You can really tell the community is growing and people are learning and having a good time. It’s been phenomenal. Neil: It’s just about meeting people and connecting in the community, and all of the presentations have been absolutely perfect. It couldn’t be better. Tad: It’s great to be able to continue to share our experience and knowledge to, now, many organizations throughout Europe and the Middle East. February 11, 2019 Alexandra Brown	Be the first to comment. Watch PowerObjects’ Field Services video to see the innovative solutions we’re providing to overcome the challenges faced by organizations with field operations. March 22, 2016 powerobjectsweb_o6z0dz	Be the first to comment. PowerTrivia is a PowerPack Add-on that lets you interact with your customers or audience in a fun and engaging way.